Matthew Vaughn’s sequel to 2014’s Kingsman: Secret Service sees the cast join forces with the Southern charm of the American Statesman in their quest to save the world. 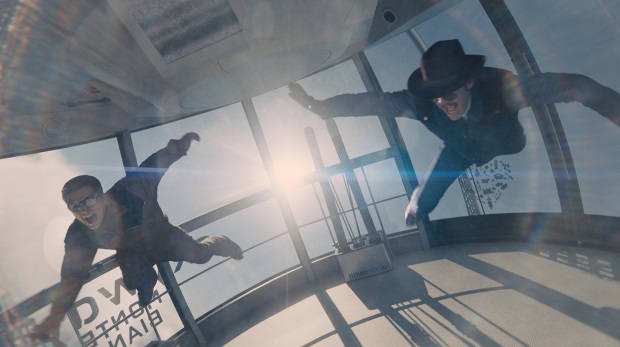 With a total of 438 shots across a varied sixteen sequences, Framestore, led by VFX Supervisor Chris Lawrence, was proud to deliver a package of stunning VFX work for Kingsman: The Golden Circle, bringing ever more outlandish action and intrigue to the spy flick. With a large number of sequences to tackle, Kingsman: The Golden Circle offered a variety of fun challenges for the team. ‘We worked across 438 shots, but they were short, broken-up pieces of work. Every time we started a new sequence we would face a new challenge’, says Fabio Zangla, CG Supervisor. Reminiscent of the Roger Moore era of James Bond movies, the tone of the film allowed the creative studio to hark back to some ‘old school’ techniques, and dive into the world of the caper comedy. ‘Our work comprised old techniques within compositing that we probably hadn’t employed for a long time’, explains Chris Zeh, Compositing Supervisor. ‘Since this show was a little bit old school in its approach, we re-learnt a couple of techniques from back in the day.’ The team used R&D to create lens defects throughout the shots, adding flares and smudges to complete the desired look. The film opens with an exciting, high-speed car chase through the streets of London, which sees three Jaguars chasing Eggsy’s (Taron Egerton) black cab. Stunt supervisor and second unit director Brad Allen was tasked with working through the action beats. ‘He’s an amazing guy who trained under Jackie Chan, he had a great approach to storytelling through stunts’, says Chris Lawrence, VFX Supervisor. ‘He would do twenty takes of a stunt, and if it didn’t capture the story beat that he needed, he’d do twenty more until he got it right.’ The planning and precision of Allen’s direction greatly helped the Framestore team when it came to mapping out their sequences in advance. As Eggsy’s taxi drives into Serpentine Lake in Hyde Park, it transforms into a submarine. The wheels of the taxi pop out and turn to face forward; propellers and fins emerge; and some ballast tanks appear. ‘It was planned really well in the pre-vis and that helped us along each stage’, explains Zeh. Plates of the taxi going into the water from the location shoot transitioned into full CG as the car went underwater, with live-action Eggsy composited into the taxi. ‘It’s still set at night so we worked with the dark, murky water of the lake, which helped with integration’, adds Zangla.